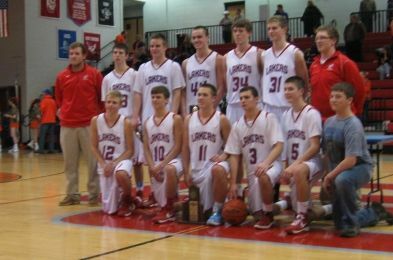 The Calloway County Lakers beat Marshall County 54-51 at Jeffrey Gymnasium last night in the championship game of the Fourth District basketball tournament. The Lakers were led by Parker Adams who scored 19 points. Connor Wagner had 17, Michael Arnett had 12, and Wade Carter had six. Chase Clark led Marshall with 18 points. Austin Renfrow also reached double figures with 12. The key to the game was defense. Calloway played zone for most of the game but they frequently changed the look the zone gave the Marshals. And that seemed to bother them as they hit just 1-of-12 shots from beyond the 3-point line. “We tried to throw some different wrinkles at them, tried to confuse them,“ Lane said. Calloway also focused on playing inside/out. Instead of just jacking up contested shots they set up their perimeter game by throwing the ball into the paint.